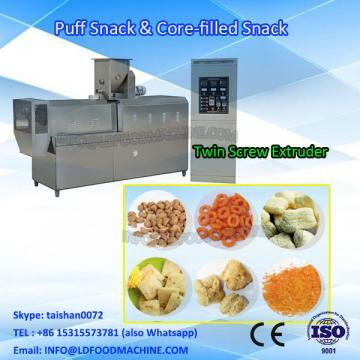 Best Puffed corn snack machinery/ extruder machinery/ Corn puff snack machinery 150~350kg/h with CE can produce different extrusion/puffed snacks. 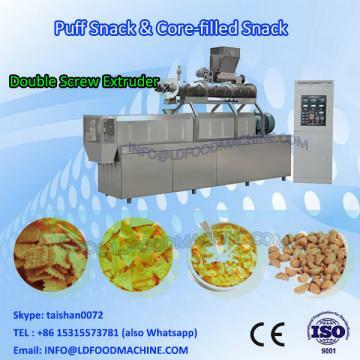 It adopts advanced share extrusion Technology,which can extrude two LDs of products with different fexture and taste out of double-screw extruder at the same time.It can produce a Variety of core-filling food which are popular in the market,such as fragrant chicken,core-filling rolls etc,It can also produce nutritional powder.grain gruel and many other through changing moulds and assistant equipments.This automatic process line is of LD level because of its superior characters "Normal materials,Cinvenient operation and maintenance,lower power consumption,higher output". Thanks for your reading! We will be always here waiting for your inquiry!